With the festival of lights-Deepavali tomorrow we all want our homes to glow with happiness. A festival is incomplete without the right decor. Diwali festival has got loads of you busy cleaning and decorating your homes. There is a lot to be done in a short span of time but the hard work you put in is sure to pay back at the end. The preparations and decorations begin one month prior to the festival and yet everything comes to an end just one day before the festival. Those who love to bring a dash of creativity in their decorations start searching for ways to get it done easily and in innovative ways. But with loads of expenses ( decor items, painting, renovation & revamping, new clothes, gifts etc) you are left with little choice but to go the inexpensive way. So here’s a great idea for you to use this diwali, go the Jugaadu route :D Yes ! Try few of the awesome diwali DIY hacks I have listed down. All of the things inexpensive can sometimes be the best decor ever! the best thing is your home will be unique and all your guests will shower your home with compliments.. The best way to save money is to come up with a jugaad and go the handmade route. DIY projects are better than an expensive boring product any day and won’t cost you a fortune! The plus side is that DIY projects will bring out the creative side of you and whole of your family can bond while making them, and once the house decoration is displayed its sure to bring you loads of compliments from guests who come to give you Diwali greetings. Whatever be your choice of Diwali decoration the important thing is that you have fun while decorating your home! Budget DIY projects are not only fun but also one can explore the hidden power of imagination and brings out the creativity inside you. So lets begin this Diwali festival with creativity and celebrate this festival in a way you haven’t done before. Just make a list of all the things needed and collect them from either your local store and corners of your house and you aready to make this Diwali a happy Diwali ! Votive candles be the best to light up your homes.. Just place them in mason jars and hang them on walls or your clothes hanging pins on walls . That’s it ! Here the jars act as glass candle holders and make up for a beautiful view during nighttime. Its easy and simple. Just find empty glass jars in your home and broken chains ! The best way to make your candle lit centerpieces interesting is to draw henna patterns with a henna cone. And stick a few kundans on the patterns! They look beautiful and won't cost you anything! If you have a more sparkly theme then stick a few sparkling artificial diamonds you have lying around. All you need is broken jewelry and glue ! What better way to put your broken jewelry to good use?! Another interesting DIY project would be to use candles to make centerpiece decorations for your dining table, coffee table or even large stools in your home. Usage of rose petals- A simple way to make an attractive centerpiece with candles is to place candles in clear glasses from your kitchen , place them in a thali or a large plate and scatter rose petals all over the plate. You can use Borosil glasses as they are microwavable and the heat will have zero effect on them. Make good use of wine glasses. Just invert three wineglasses in a triangle on a plate and place votive candles or huge decorative candles on them.To make it even prettier place sunflowers, marigold or any other flowers at your home under the glasses like shown in the picture, simple? doesn’t need any expensive materials and look like million bucks ! These are very simple to make and give a beautiful look to your home. You just need sea shells and candles to melt in them.. and your beautiful DIY seashell candles are ready.I am myself fond of collecting sea shells whenever I visit the beach .Its the best way of putting them to use for beautifying our homes. Seashell candles look uber cute and increase the natural elegance of the house. Read the whole tutorial here. If you have cups that are broken and only one or two cups from the tea set are left you can put them to excellent use and create beautiful coffee cup candles ! You can even stickk a few motifs or studs to the cups to make even more attractive ! 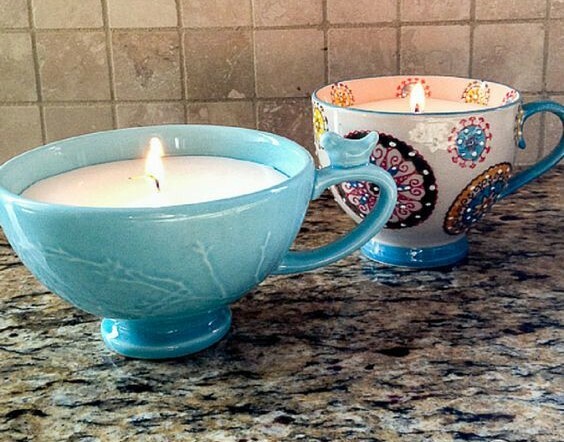 These decor candles can be made from waste cups in your kitchen! Diwali décor is all about lights and with these ornamented tea lights, your living room is ready to greet guests for an evening of festivities. 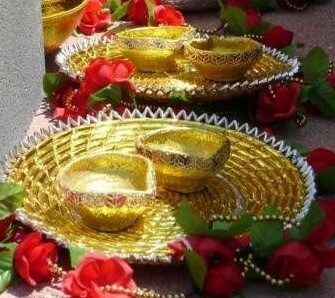 A diya is a very important accent of Diwali festival. 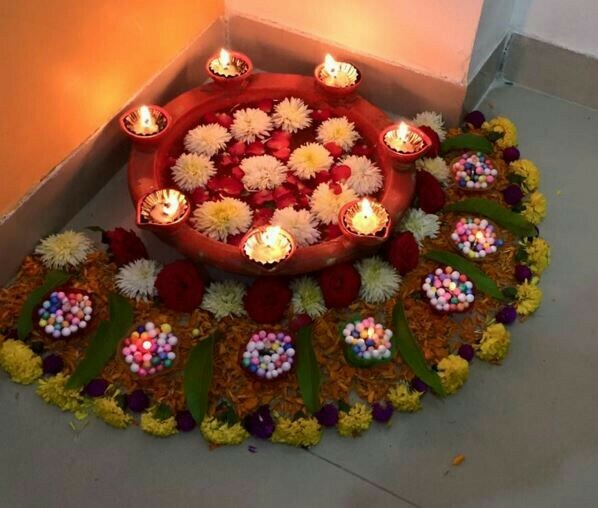 Flickering diyas when done with unique ideas can turn into stunning light charms while spreading light throughout the place..With the below ideas you can turn simple diyas into charming light spreaders! If you are looking for innovative ways to light your home, this DIY project is what you have to give a try! Diyas made out of orange peel ! 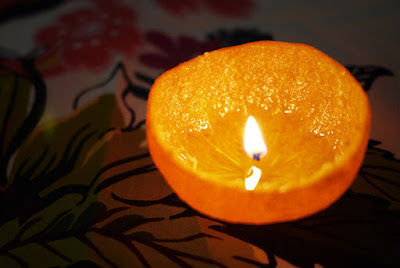 You just have to scrape out the orange carefully (I do it by cutting the orange into half and bringing it inside out and removing the fruit) once the peel is empty, pour olive oil and place a cotton wick , light it up ! Easy peasy? Jazz up those clay'ed up diyas by manually hand painting them with black or blue paint and make small dots on it to beautify them ! 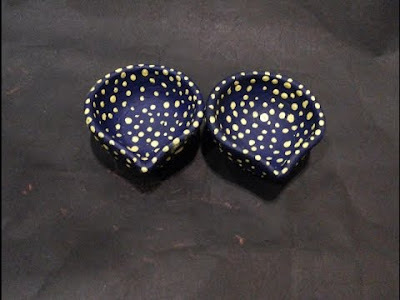 Beautiful polka dotted diyas are ready! Color the inside with one color and paint the outside with another. Stick a few pearls at the rim to complete the beautiful look! Use golden colored oil paints to paint the diyas and draw designs with white paint ! Rangolis are considered to be sacred and drawn on the ground. Rangolis are mostly colorful and made using rangoli powder, diyas, fresh flowers, flower petals , but the easiest and most loved Rangolis are flower Rangolis!This diwali make the best use of these Rangolis and decorate the corners of your home. You can also use leaves, Kundans and diyas to accentuate the flower Rangolis. 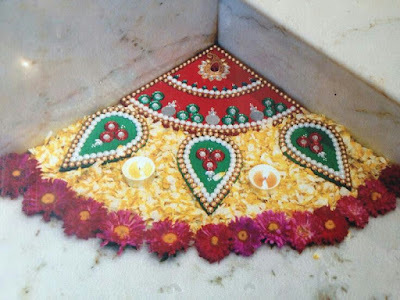 Everybody make them at the entrance but give Rangoli a uniqueness by making them in the corners of your home, sure to get loads of compliments! Make those boring corners of your shine and speak volumes with these beautiful corner rangoli DIY projects! 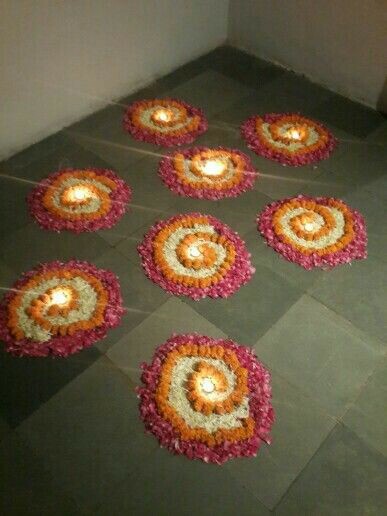 Lovely DIY Rangoli made from Kundans and flower petals, for a more stunning look place tea lights between the design. This simple fuss free Rangoli is so to make! Just place marigold garlands in a circle and fill it with mogra flowers and rose petals in the border. Place diyas in the center ! Tada. Beautiful rangoli! Flower designs on a thali and place them around your house ! Simple and cute Rangoli design idea ! We all know that lighting holds a very special significance during Diwali. to light up your homes you don't need to spend a fortune on fancy materials or run around shops. With these simple DIY projects you can add lights to each and every corner of the house and even enjoy while doing so. Try few of these DIY ideas to bring brightness to your house. Lanterns and lighting is what makes your home more elegant and beautifyl. Try few of these DIY projects to make your home shine with light. If you have spare set of shuttlecocks lying string them up and place fairy lights in them and your pretty shuttlecock lamps are ready! Your rooms our where the guests will relax or even your relatives might want to check out. Its better to decorate your rooms in the best manner. Here are a few DIY beautiful ideas to decorate your rooms. The walls of our homes our the most important when it comes to decorating but with so much in hand we hardly have time for decorating them. Hence easiest way to save time and get your walls done is to indulge in easy DIY for walls. You can make a beautiful tassel toran and hang it like the one below. Just get hold of an old dupatta with tassles. Pick a stick from your garden and twine all the latkans into the stick, viola ! A beautiful wall decor piece is ready! Or you could even try this easy peasy bangle decor. Don’t we all have those loads and loads of unused glass bangles lying in our wardrobe corner, its a great way of making use of them. Just bunch up the bangles and tie em up with a ribbon, tada ! Beautiful bangle decor hangers are ready! DIY wall decals: You can use sparkly washitape , cut em into triangles and stick them on the corners where the paint has started chipping. Or you can hang up a frame to hide the faults on your walls! Table decor can be very expensive but with these simple DIY projects you can create beautiful table centerpieces without spending much. 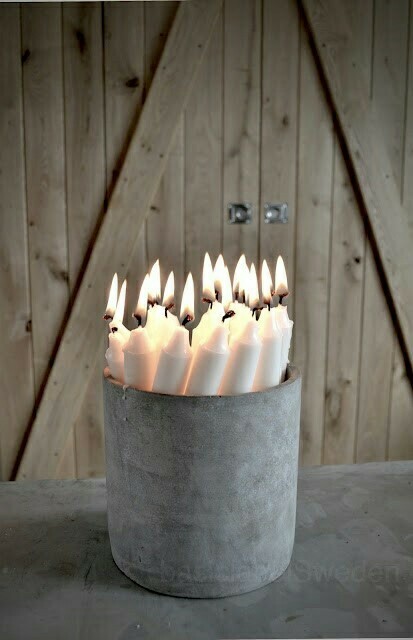 Bunch up a dozen of thin plain candles and place em up in an old bucket ! Viola makes for a perfect rustic table centerpiece to entertain your guests. Use mason jars to keep fresh flowers and twigs . Hang in a few family photographs of your previous diwali with ribbons for a simple classic centerpiece. Use Morrocon Tea Glasses , place tea lights in them. and decorate with kundan around the gasses. Just remember Diwali isn’t so much about the splurging on decor or clothes or the crackers as much as it is about beautiful lighting, creative decorating and family bonding. It is an opportunity for the family to work as a team to produce delicious homemade sweets , spread happy diwali messages and create humble decorations. This Diwali try not to waste money on expensive fireworks that damage the environment and harm your animals. Try enjoying it an eco-friendly . 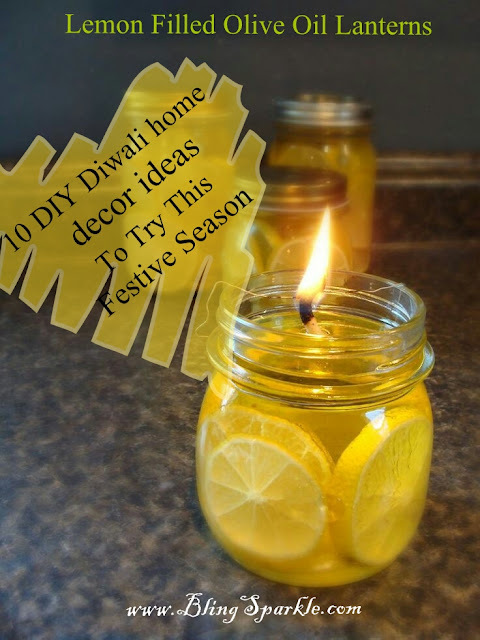 Try the above DIY Diwali decoration ideas to have an eco-friendly celebration. Lets pledge to go eco friendly this Diwali.